So recently I got in to up-cycling and how I can use it to make our world a little better. As a small business I try to source things in the US whenever possible and if I can I’ll source supplies in Arizona where I live. Buying local and keeping money local helps the economy of my area. Another thing I’ve gotten into is turning trash into new things so they don’t just get thrown away. One of these things is bicycle inner tubes and plastic grocery bags. Rubber and plastic are very toxic products so I am starting projects that will incorporate recycling them so that they don’t end up in landfills or if they do they’ll be easier to recycle and brake down. I have a whole box of bike inner tubes waiting for my attention right now. I’ll be posting about that later. Yesterday I came across a great tutorial on etsy on how to turn plastic bags into a fabric type substance so that you can create reusable tote bags for shopping. 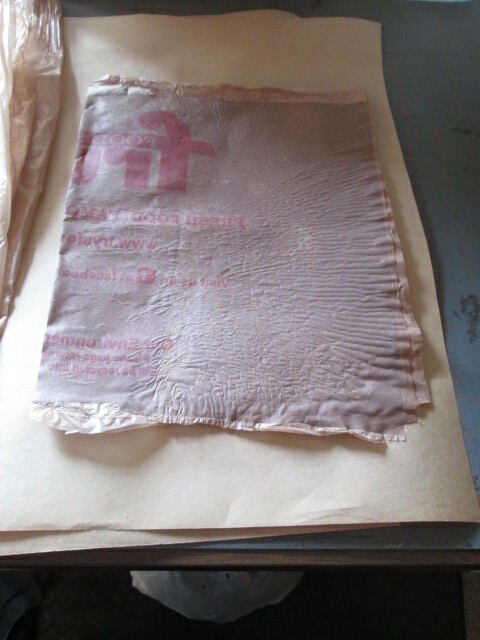 This is my attempt at fusing plastic bags to create a fabric. 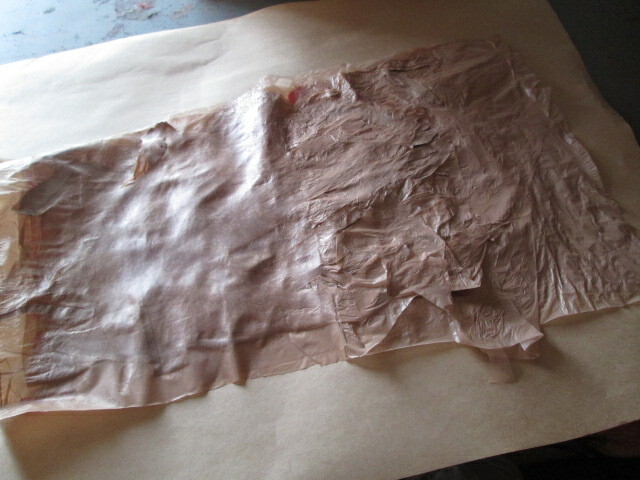 I started with the amount the tutorial suggested of eight layers of plastic bags. I folded them neatly then cut the handles and bottoms off. This is the result of that. I actually folded the eight layers in half here and created 16 layers which came out pretty cool. 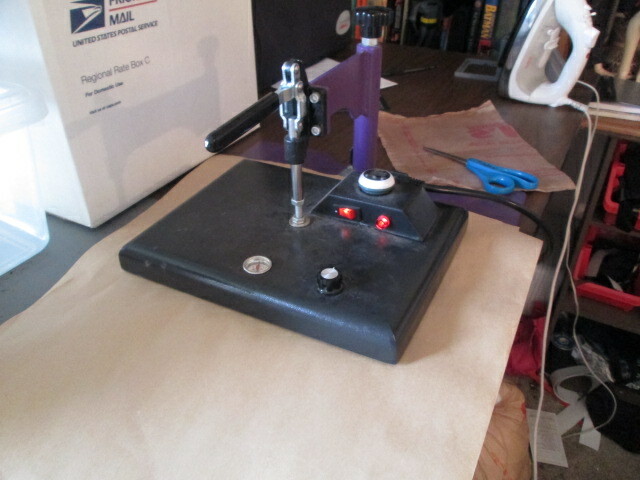 I used a heat press instead of an iron (suggested by the tutorial) to fuse the bags. I decided that those scraps of handles and bottoms needs to not be wasted so I experimented with fusing the loose pieces. After a little trial and error I found it worked fine. 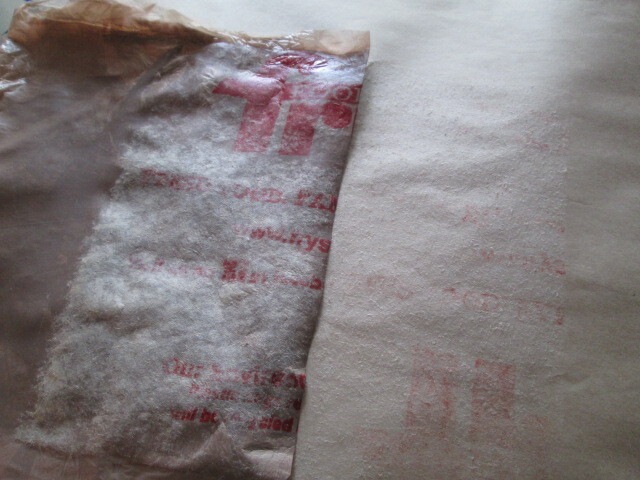 I had the heat press a little too hot and the plastic stuck to the paper. 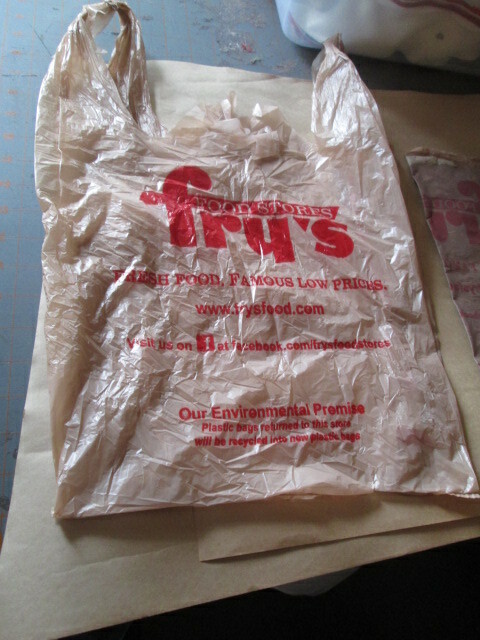 I’m excited to make more plastic fabric and create reusable shopping bags.